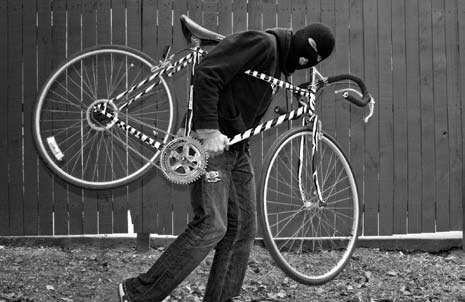 Bicycle theft is a big problem in the Bay Area, but with a few simple precautions you can significantly decrease the chance of someone making off with your property. Write down your bicycle’s serial number, make, model, color, and other distinguishing characteristics, and keep this info in a safe location. Take photos of your bicycle. This will come in handy if you have to describe your bicycle to the authorities and spread the word about a theft. Etch your driver’s license/ID number into your frame, or write your contact info on a rolled up piece of paper inside the handlebar or seat tube where a thief is unlikely to look. This can help police link your bicycle back to you. Bike East Bay is also offering free bike registrations in person at events around the East Bay. Check out this video from our 2014 Pedalfest event in Oakland’s Jack London Square, where over 250 people had their bicycles registered on the spot. 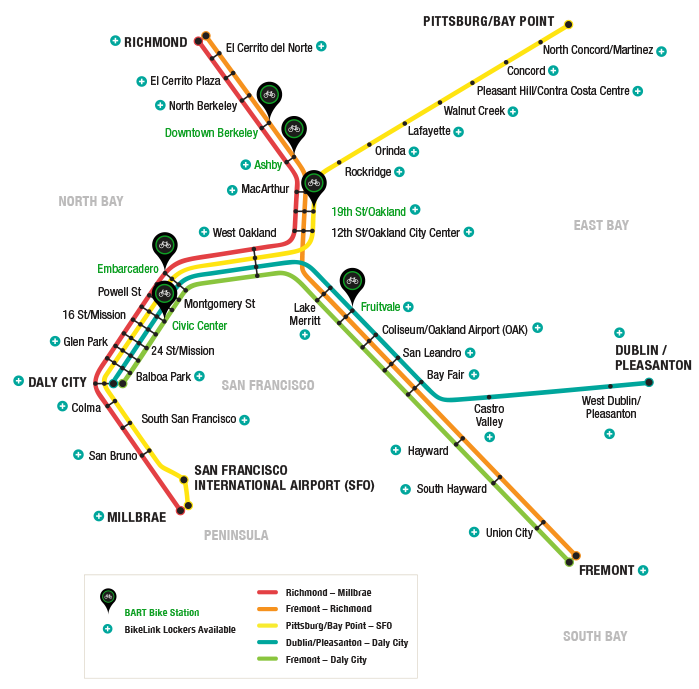 In May 2014 BART police received 53 stolen bicycle reports, over 80% of which were secured using only a cable lock. A cable lock by itself can be cut using shears in just a few seconds, and offers almost no protection at all. Instead, use a high-quality U-lock designed for bicycles or motorcycles. Used a keyed, not combination, lock. You will end up paying $40 or more, which seems expensive but is a worthwhile investment to avoid replacing your whole bike due to theft. Click here for a list of features to look for when choosing which U-lock to purchase. Click here for a comparison of the top U-lock brands: ABUS, Kryptonite, and OnGuard. A second U-lock, chain, or cable to secure both wheels and the frame. Locking skewers to secure the wheels to the frame. An additional chain or cable lock to secure the bike seat to the frame. Keeping your U-lock clean and working smoothly by applying some bike chain lubricant into the keyhole and lock mechanism once every couple of months, or anytime your lock has been left out in the rain. Anything that you don’t want stolen should be secured, or taken with you. This includes bike lights, bags, bottles, your helmet, etc. 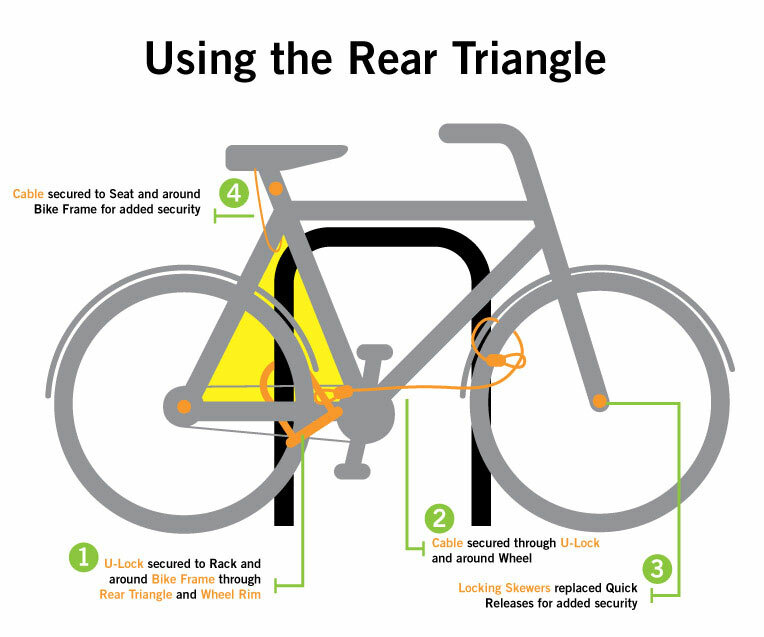 Talk to an employee at your local bike shop about these and other bike security options. Of the 53 stolen bicycle reports BART police received in May 2014, 19% of them were locked up outside overnight. If you must leave your bike out overnight, use one of the inexpensive BikeLink lockers or rooms available at BART stations and other East Bay locations for only 3-5¢ per hour. Purchase a $20 BikeLink card which will get you up to several years worth of access at all of these secure facilities, with more being added every year. Some BART stations provide free valet bike parking, and others have BikeLink card-accessed rooms. Click on the map below for more details. Video: Secure bike parking at BART stations. 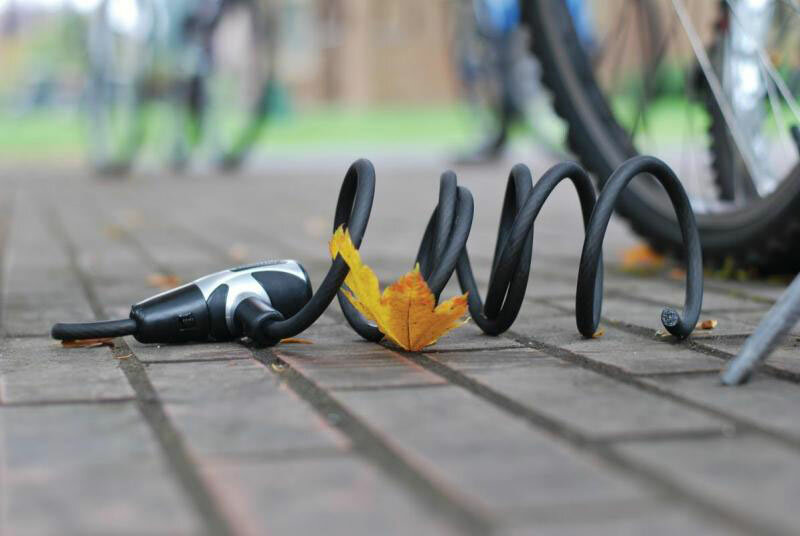 Lock your bike to a solid, metal object (not a chainlink fence, tree, or wooden railing). Use a bike rack. If none are available then permanent metal poles or parking meters work, if they have a top that your bike and lock and just not be lifted over, and bolts that can not be easily removed. 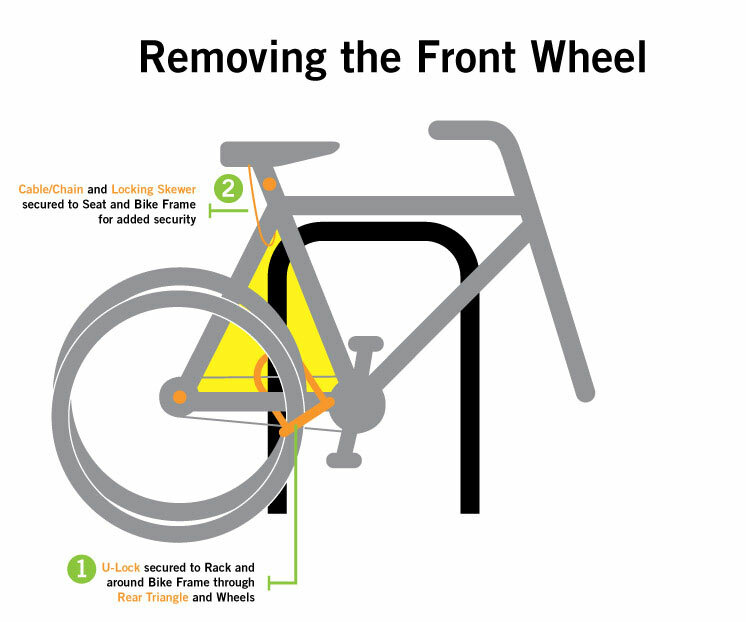 Shake the bike rack, pole, or parking meter to ensure that it is secured to the ground. Do not lock your bike so that it blocks a sidewalk, curb ramp, or railing. In some areas locking to a parking meter is also not allowed and can result in a confiscated bike. If a rack is available, use it, and if there is not enough bike parking talk to the business owner or contact the city to request additional racks. Oakland, for instance, has an online bike rack request form that you can fill out online here. Lock securely to nonmoveable metal fixtures if storing your bikes in a garage or shed. Do not store your bike in an outside yard or commons space. Check to see if theft is covered in your home owner’s or renter’s insurance policy, for bikes stored indoors. Ask your landlord to provide a secure bike room, if you live in an apartment. If there is one then use it, but still U-lock your bike. Alternately, you can use two U-locks: one for the front wheel and one through the rear triangle of your frame that also secures your rear wheel. The lock should encircle the rim and not just the spokes of the wheel. While no lock can offer 100% security, employ a good locking strategy that has “layers of security”. Thieves will try to steal the bike that offers the least resistance and attracts minimal attention in the process. So if you have a U-lock securing the frame and wheels, locking skewers on the wheels, and a cable securing the seat, a thief will probably go after another bicycle that is poorly secured by comparison. CRUCIAL FIRST STEP: File a police report. This might feel pointless but stolen bicycles are recovered quite often, and without proper documentation they can’t be returned to their owners. Also, theft reports help police know where and how to allocate their resources. It’s often better to file the report in person (which expedites the process to 1-2 days) via phone/online (up to 10 days). Check the Bicycles at Bay Area Flea Markets Flickr Group for your bike. Post to the Stolen Bicycles Bay Area Google Group. Register your stolen bike at BikeIndex.org. This is an excellent, free searchable online database that also auto-posts to Twitter. The bike registation site Project 529 also has a free, searchable database. Scan local Craigslist and eBay listings to find your bike, using Google alerts or some other automated search tool. This can yield results even months after the theft. If you find your bike we do not recommend confronting the seller yourself as they might react violently. Instead, ask the police for assistance, and bring a photo of your bike and your police report as proof of ownership to reclaim your property. Even if the seller is not the person who stole your bike originally, they still have no claim to the property and do not require compensation.